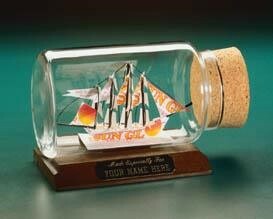 You don’t have to be a sailor to appreciate the fine detail in this business card ship in a bottle – Business Card Sculptures Clipper Ship in a Bottle! Use this ship as a sales or incentive award for travel agents, vacation planners or the charter or marine industry. For more gift ideas for fans of boats and ships, click over to Category: Boats, including a couple of cruise ships, an oil tanker, Pirate Ship, Sloop and Yacht, which you will all find in the sidebars. Also, one of our newest creations; the LNG Ship.